Today I wanted to share with you a birthday card I made for one of the ladies that I work with. Yesterday was her birthday and we always celebrate by giving each other a card and of course ………. any excuse to eat cake. I started by running a piece of teal cardstock through my Cuttlebug using the Seeing Spots folder and attached it to the pink card base. I just love this pink and teal cardstock from Recollections. I colored the image in with my Copics and a few Bic Markers. For an extra little bling I used Glossy Accents for the cherry on top, as well as some Stickles in Crystal. I put two thin layers behind the main image and then used some popdots for dimension but only for the top half. 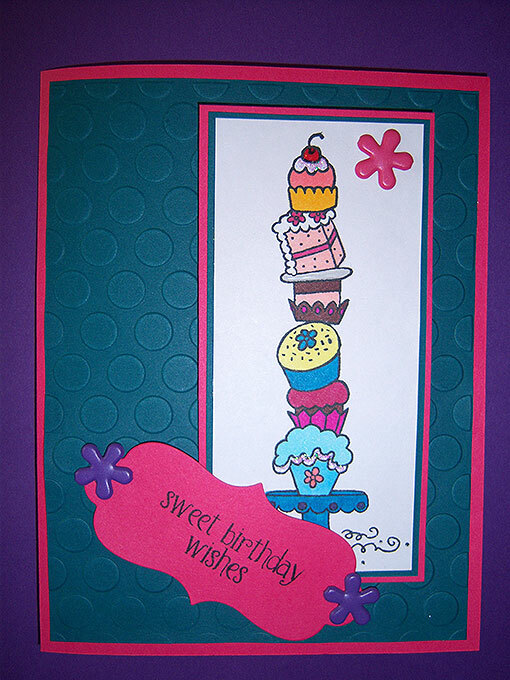 “Sweet birthday wishes” comes from the Say It Sweet stamp set from Pink By Design. I have a sweet tooth and this stamp set has a lot of great sentiments for anyone who does. I used the Cuttlebug and the Spellbinders Grommet Tag Die set to cut out and then stamp the sentiment on. I then attached it with some Flower Brads from Recollections that I picked up from Michaels. I used two different stamp sets for the inside of the card. I used the Pink by Design Simply Everything stamp set for the “It’s Your Birthday !” and the Inkadinkado Eat Cupcakes set. I will be posting some more birthday cards soon… May is such a busy birthday month.